PCDJ DEX 3 is professional DJ Software for Mac that allows you to seamlessly mix music, music videos and host karaoke shows. DEX 3 gives you full control over your media, allowing for more creative freedom while mixing than ever before. With our beat-grid based automatic beat mixing it's easy to blend tracks, allowing you to focus on the other aspects of your mix. Since DEX 3 offers no-latency playback; loops, hot cues, and all playback features are ultra-responsive. Use DEX 2 with a keyboard or mouse, or use one of the 65+ supported DJ controllers for tactile hands-on control. 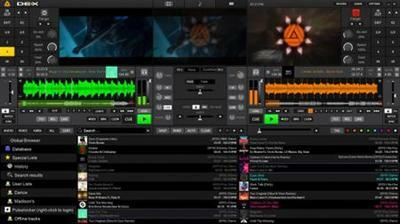 So download DEX 3, import you tunes, and cue up your imagination - DEX 3 is the complete DJ mixing software solution. DEX 3 makes it easy to mix everything. The DEX user interface emulates the look and feel of CD Decks and includes mixer controls much like you find on physical DJ mixers. Use a traditional 2-Deck interface with or without video mixing controls, or layer in your mix with one of the included 4-Deck skins. BPM beat-sync, looping, key-lock, hot cue points, filters and effects all work flawlessly whether you?re mixing audio or blending music videos. DEX 3 includes an advanced media file browser for all your music, music videos and karaoke files. The included library filters allow you to view only the file type you want to work with, and the fast search feature displays results as you type. Create custom playlists or generate lists from directories on your hard drive. Album art and color coding makes it easy to find the song/s you're looking for. Playlist playback automation is built right in; engage Automix or Shuffle Play if you need a break. PCDJ has teamed up with two great record pool services for pro DJs. Our partners at the iDJPool have the hottest new music in 320kbps MP3, plus 2 years of back catalog available in all popular genres to subscribers. Get unlimited downloads in all genres for only $50, or select the "Country Pool" or "Urban Pool" options only.